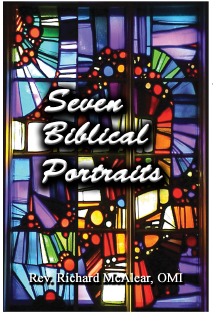 The Book "Seven Biblical Portraits" tells the stories of some little known figures from the New Testament. Each person portrayed in the book has a role in the Gospel story and can teach us much about the heart of the Gospel. Click on the play button below to listen to this short excerpt from the book. It is a reading of the forward to the book. One little book, seven powerful teachings! Thank you, Father! With Father McAlear's magnificent ability to teach profound truths in a clear and concise manner, his book "Seven Biblical Portraits", reveals to us the power of faith, hope, and love, in a very moving and compelling way through a series of stories of seven biblical figures, scripting for us Jesus' personal relationships as they unfold in the story of the Gospel. As Father states in the Foreword, "the Gospel is a human story with profound spiritual depth, told on the stage of life as lived by real people. Getting to know these people and their stories offers us deeper insights into the story of Jesus." You will learn about the people who knew Jesus and had a real relationship with Him. Father tells their stories in such a way that you will find yourself experiencing their encounters with Jesus as if you were there at that very time and place. You will be impacted in powerful ways spiritually and emotionally. All that you read about these people will come alive in your heart and soul in a way that you will not experience in any other book. Father gifts us with amazing insights and knowledge of these people and their stories. Chances are you have not heard anywhere else before, many of the details of the lives of these people who interacted with Christ. You will thoroughly enjoy this book, gaining from all that it teaches, as Father offers us a deeper insight into the life and story of Jesus, bringing us closer to Him. "This book moved my heart, opened me to new spiritual horizons, blessed me...."
"Very powerful and moving chapter on the story of Longinus!" "After reading these stories, I can imagine how I might have been able to encounter Jesus at that time. I return to the stories again and again, and each time I am drawn closer to Jesus and the people who encountered Him as well. Thank you, Father McAlear!" "Beautifully written! Deeply insightful! I highly recommend it!" "So many amazing things I never knew before! Thank you, Fr. Mac!" "I strongly recommend this book to anyone looking to deepen their relationship with Jesus!" "I especially enjoyed and learned so much from Father's knowledge and understanding of Joseph's role in the life of our Lord Jesus and how much Joseph can teach us about our own lives today." "Profound! This book should be included as a valued addition to the collection of all who teach and give direction to souls about the faith."